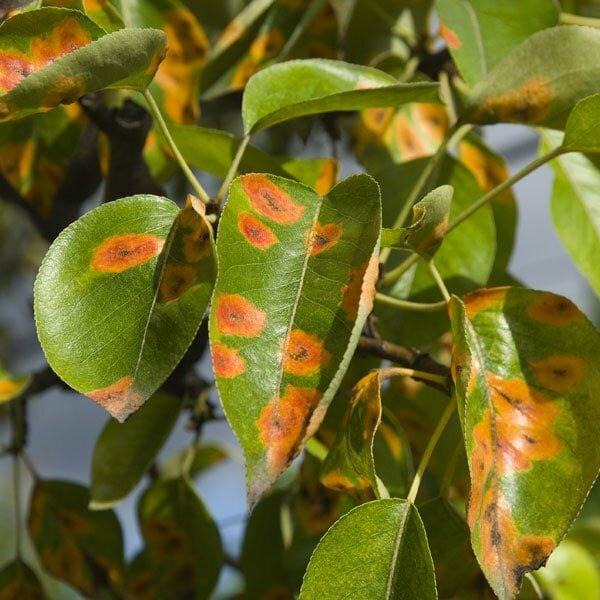 Learn how to identify and get rid of rust on plants using proven, organic and natural methods. There are more than 5,000 known species of rust on plants. Common rust (Phragmidium spp.) 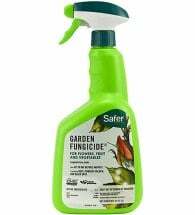 is a fungal disease that attacks roses, hollyhocks, snapdragons, daylilies, beans, tomatoes and lawns. It is most often found on mature plants where symptoms appear primarily on the surfaces of lower leaves. Early on, look for white, slightly raised spots on the undersides of leaves and on the stems. After a short period of time, these spots become covered with reddish-orange spore masses. Later, leaf postules may turn yellow-green and eventually black. Severe infestations will deform and yellow leaves and cause leaf drop. Rust diseases are favored by 4 to 8 hours of low light intensity, warm temperatures and moisture — humidity, dew or rain — followed by 8 to 16 hours of high light intensity, high temperatures and slow drying of leaf surfaces. Black spores are visible on leaves and stems in fall and overwinter inside infected stems which are distinguished by dark, corky blotches at points of infection. The spores are spread by wind or by water splashing back up onto the foliage. Select rust-resistant plant varieties when available. Pick off and destroy infected leaves and frequently rake under plants to remove all fallen debris. Water in the early morning hours — avoiding overhead sprinklers — to give plants time to dry out during the day. Drip irrigation and soaker hoses can be used to help keep leaves dry. 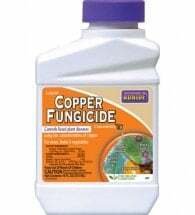 Apply copper sprays or sulfur powders to prevent infection of susceptible plants. For best results, apply early or at first sign of disease. Spray all plant parts thoroughly and repeat every 7-10 days up to the day of harvest. 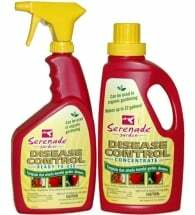 Effectively treat fungal diseases with SERENADE Garden. 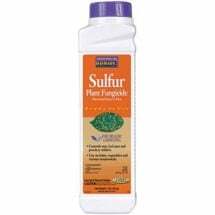 This broad spectrum bio-fungicide uses a patented strain of Bacillus subtilis and is approved for organic gardening. Best of all, it’s safe to use — you can treat and pick crops the same day! 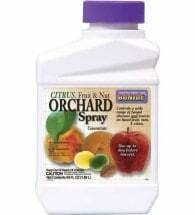 Containing sulfur and pyrethrins, Bonide® Orchard Spray is a safe, one-hit concentrate for insect attacks and fungal problems. For best results, apply as a protective spray (2.5 oz/ gallon) early in the season. If disease, insects or wet weather are present, mix 5 oz in one gallon of water. Thoroughly spray all parts of the plant, especially new shoots. Prune or stake plants and remove weeds to improve air circulation. Make sure to disinfect your pruning tools (one part bleach to 4 parts water) after each cut. Burn or bag infected plants after the growing season (see Fall Garden Cleanup). Do NOT compost.